In today’s competitive market, 3D Coordination is becoming an Engineering standard. We offer full 3D BIM/Coordination and collision checking. 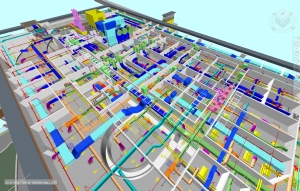 3D Coordination includes duct routing, duct elevations, off-set and transition information, straight duct and fitting lengths, connection types, framing locations, and real time collision checking. We also offer 3D Coordination for HVAC Piping and Plumbing. Servicing Northern Michigan for the last 35 years, Cooke Sheet Metal provides HVAC engineering services including sheet metal fabrication and installation using full 3D CAD modeling and coordinating, CAM, and CNC controlled plasma cutting equipment.